I was 14 years old when I had my first taste of a day in the mountains. A group of older friends were doing a charity hike through the Lairig Ghru and asked if I wanted to join them. I remember being in awe of the massive mountains that reared up on the left hand side as we hiked in towards the Pools of Dee. They were dark and menacing with heavy clouds darkening their appearance. This may have been the initial hook that led to this addiction! My next foray to this part of the world was back in July 2003 when I was a bit fitter than I am now!. 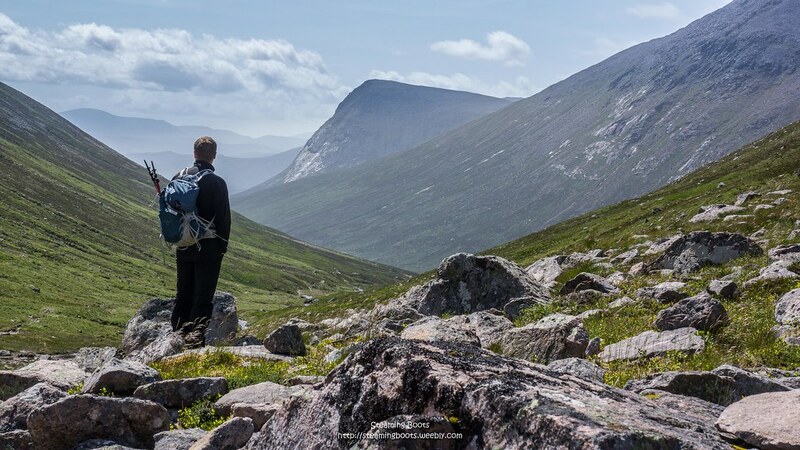 I cycled in and up Glen Dee to continue on foot around six Munros on the Western side of the Lairig Ghru! A long day it was and enjoyable – the navigational skills were also tested that day!! I’ve been back to the Cairngorms lots but never really back into the Lairig Gru to any extent. 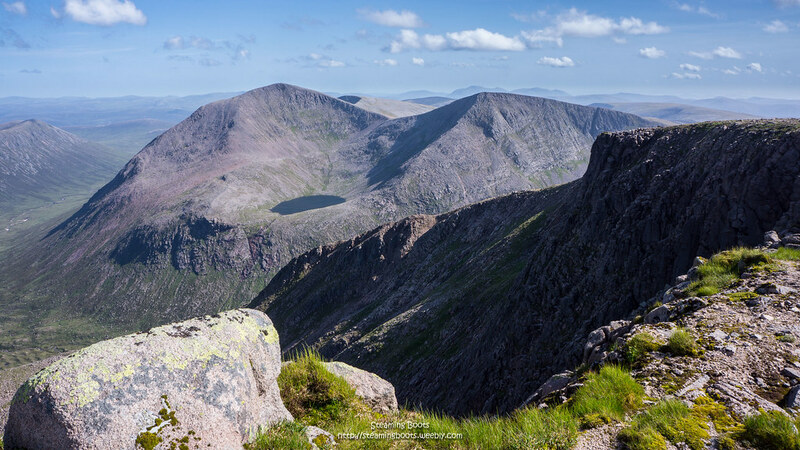 When I picked up “Classic Mountain Scrambles in Scotland” (Andrew Dempster) back in the late nineties, I noticed there weren’t too many easier scrambles in the Gorms. 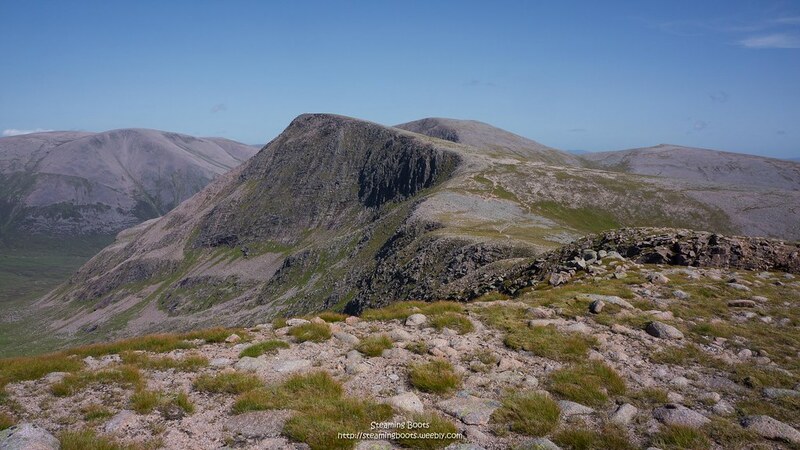 Fiacaill Ridge is a classic and has been done many times, but I always fancied Angels Ridge, but somehow had never found the time to try it out – until now…. My brother fancied Braeriach so I suggested a wee detour round to Angels Ridge as part of the route. The long summer days are a fine time to do this as the distances involved are large! We set off from the Sugarbowl car park around 9am and it was blustery, the forecast suggesting arduous walking on higher areas in the morning – this may have included the 450m start point! It did however have the advantage of keeping any biting beasties at bay! Soon we were at the Chalamain Gap, boulder hoping our way through as the cloud started to part. The skies were looking good! Dropping down we met the Lairig Ghru and continued up to the Pools of Dee, stopping for some lunch here. It was now after 11- and we hadn’t even started climbing properly yet! The best part of the walk (excluding the scramble) came next in my opinion. Skirting the hillside into the An Garbh Choire produced some stunning views down Glen Dee and also into the massive Corries that dominate the skyline – a superb place and well worth the effort. I had hoped the Corries may have provided some shelter but the opposite was true- the wind was whistling down off the plateau and seemed to intensify as it hit the corrie floor- I was starting to doubt if the ridge option may be a no goer due to the gusty wind! Stopping at the tiny Garbh Coire Bothy (maybe better described as an emergency shelter!) we had a second lunch before starting to ascend in a steeper fashion! A short time later and we reached the shores of Lochan Uaine which turned out to be a little less windy, strange as this must be one of the highest bodies of water in Scotland perhaps? Third lunch (well sweeties) were had here as we lounged about taking in the views. The ridge didn’t look too steep or narrow so we decided to give it a go and were soon scrambling up easy angled granite boulders with superb frictional properties As you get higher on the ridge there are few slightly steeper steps but nothing too difficult- it’s the location that makes this a special scramble! Reaching Angels peak we decided to nip over to Carn Toul – it looked really close! About half an hour later and we were sheltering in the summit circle! The wind was at its worse here – literally blowing us about and we were glad to descend a little and leave the gales behind! Back up to Sgor an Lochain Uaine and we had the last peak (or rise in the Plateau) in our sights. The cliffs and Corries that surround Braeriach must be some of the finest in Scotland and the hike round them was superb in these conditions. Although windy the skies were clear and the views amazing. Knackered, we arrived on Braeriachs summit after four. Now it was the long walk back, finally reaching the car around 10 hours after starting. A long day but definitely worth the effort – a fine day in the CNP.